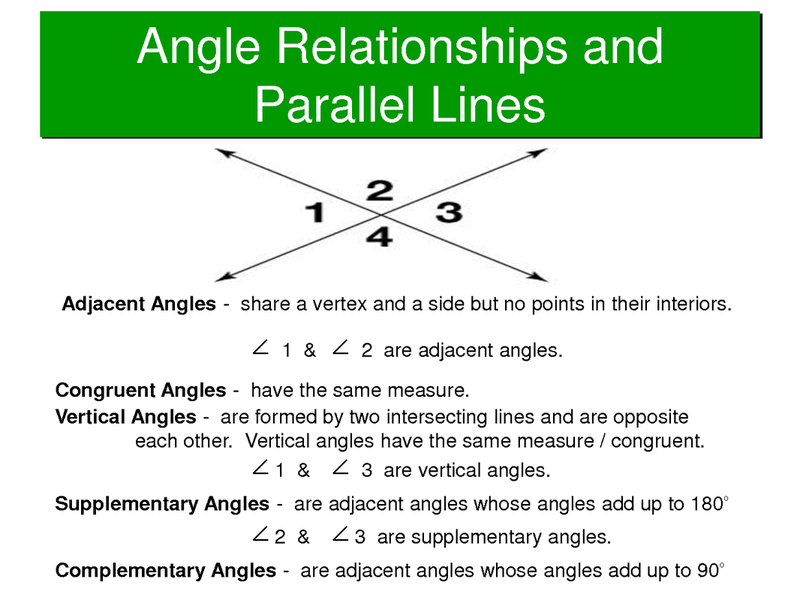 8.G.5 - Angle Relationships - Use informal arguments to establish facts about the angle sum and exterior angle of triangles, about the angles created when parallel lines are cut by a transversal, and the angle- angle criterion for similarity of triangles. 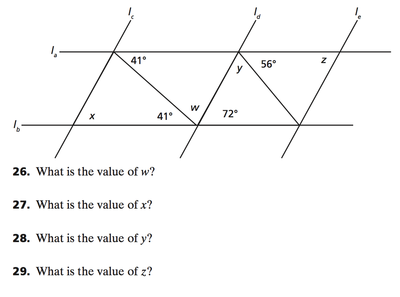 For example, arrange three copies of the same triangle so that the sum of the three angles appears to form a line, and give an argument in terms of transversals why this is so. 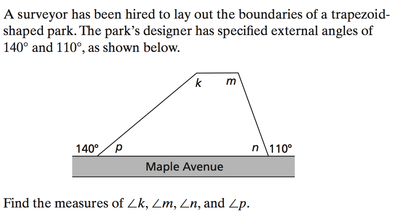 In order to understand this standard, you need to know some vocabulary and some angle relationships. You can see the definitions in the image to the left, and to the right you can see some pictures of what they angle relationships look like. As you can see in the image to the left, there are some terms and some terminology you need to know. 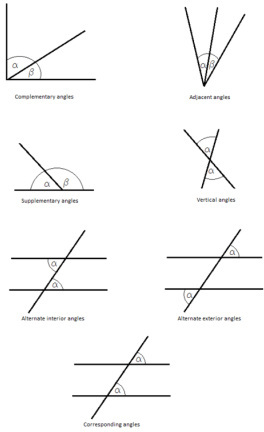 Congruent means that two angles are the same shape and size. 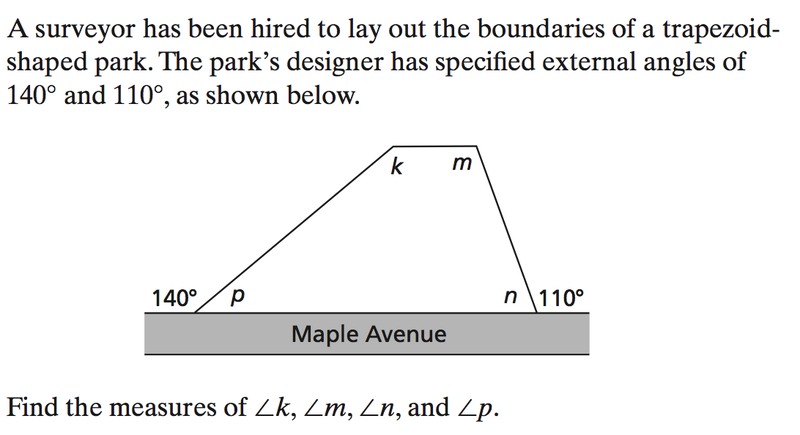 Corresponding means that the angles are "in the same place." Alternate means on opposite sides. 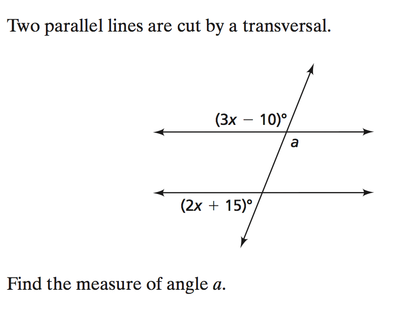 Alternate angles are on the opposite sides of a line. 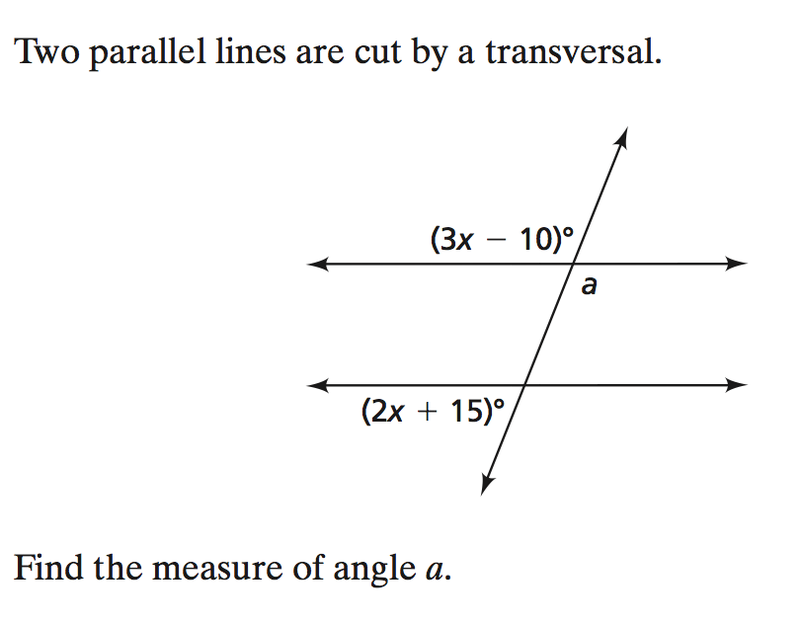 Exterior angles are angles that are on the "outside" of two parallel lines. If you are thinking train tracks, they would be angles that are outside the tracks, meaning the train would not "run over them." 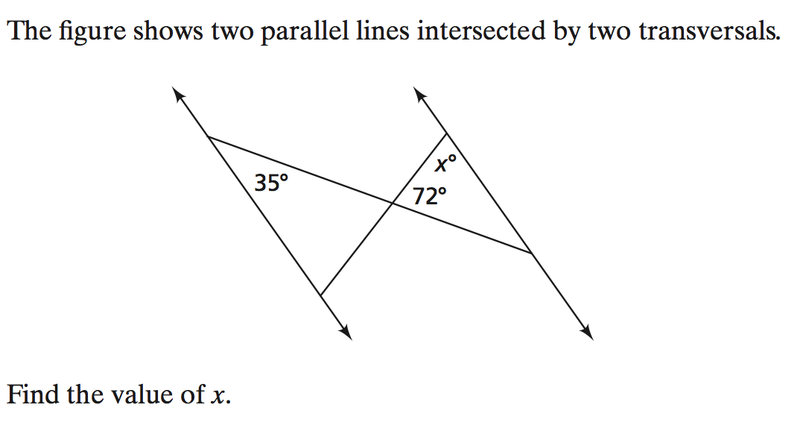 Interior angles are angles that are "inside" of two parallel lines. They would be in between the train tracks. Finally, vertical angles are angles that would be "across" from each other when two lines intersect. 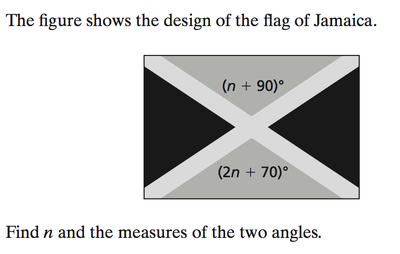 They would be on opposite sides of the X that is formed. A couple videos that can help to explain this standard. 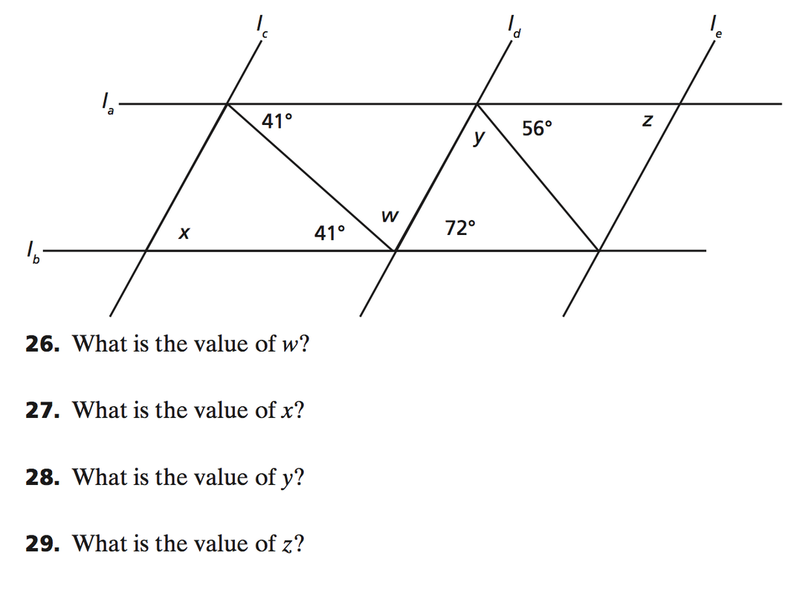 As you can see to the right, there are 9 problems that I found at the website Connectedmath.com that I clipped and put at our site. 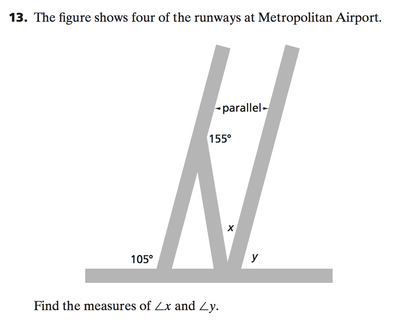 Here you will be able to do some practice problems that will allow you to see if you understand the concepts from this standard. 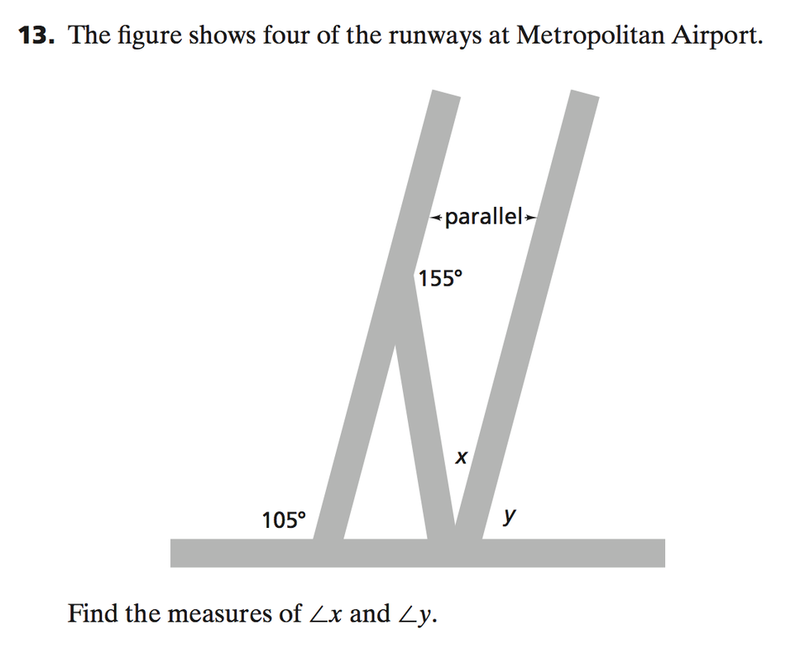 Click on any of the images, and it will make it larger so you can see the problem. To get your answers, click on the button below to take you to the answers.